Graduate student Mena Morcos has always been intrigued by structures – how they are built, how they function and how they stand up to environmental stressors. His passions led him to the Lassonde School of Engineering at York University to begin an MASc in civil engineering, under the supervision of Civil Engineering Department Chair and Professor Dan Palermo. 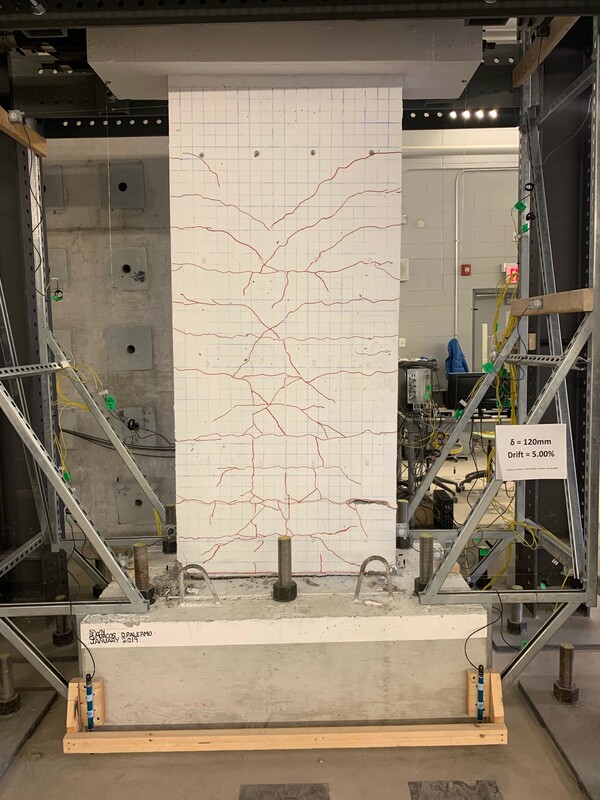 Last week, as part of his graduate research, Morcos completed a major test on a concrete shear wall reinforced with an emerging material called Shape Memory Alloy (SMA) in the Bergeron Centre’s High-Bay Structures Lab. SMA is a compound that “remembers” its original shape after experiencing deformation. The test is part of Morcos’ research on the seismic behaviour of SMA-reinforced slender concrete shear walls. Using smart materials, Morcos hopes to produce sustainable, resilient and self-centring structures. “My focus is on assessing self-centring shear walls reinforced with Nitinol SMA. Nitinol is a metal alloy made up of nickel and titanium with a super elastic capacity as compared to traditionally used steel reinforcement,” said Morcos. The use of Nitinol as an alternative reinforcement in concrete shear walls enables buildings to readjust vertically after being laterally displaced by an earthquake. Nitinol provides a non-linear response, with similarities to conventional steel reinforcement. However, Nitinol experiences material phase transformations during loading, and it is through these transformations that recovery of the straining is induced, leading to self-centring in the structure. The tests conducted subjected each wall to quasi-static load reversals to simulate the motions of an earthquake, defined by a set of consecutive lateral displacements, to failure. The hydraulic actuator displaced each shear wall in-plane in the positive and negative directions following a series of gradually increasing lateral displacements. In a quasi-static simulation, “seismic motions,” referred to as lateral displacements, are applied very slowly to allow for observation and the collection of performance data at a controlled pace. A total of 50 instruments were used to monitor and record the behaviour of each wall through the shifts. Each test took about 20 hours to complete. At present, the buildings we commonly see lining the skylines in seismic zones are typically constructed with traditional materials. These structures, specifically those that are considered modern, are designed to withstand the seismic motions of a major earthquake. In doing so, they experience heavy, irreparable damage, leading to demolition. This Nitinol SMA research provides a new reinforcement technology that has the potential to challenge the limits of a traditional industry, ultimately advancing structural design and the resilience of our infrastructure. Morcos is optimistic for a future with sustainable, smart structures. “To me, a career in structural engineering is a form of public service by giving back, which comes with a sense of leadership, satisfaction and reward,” he said.